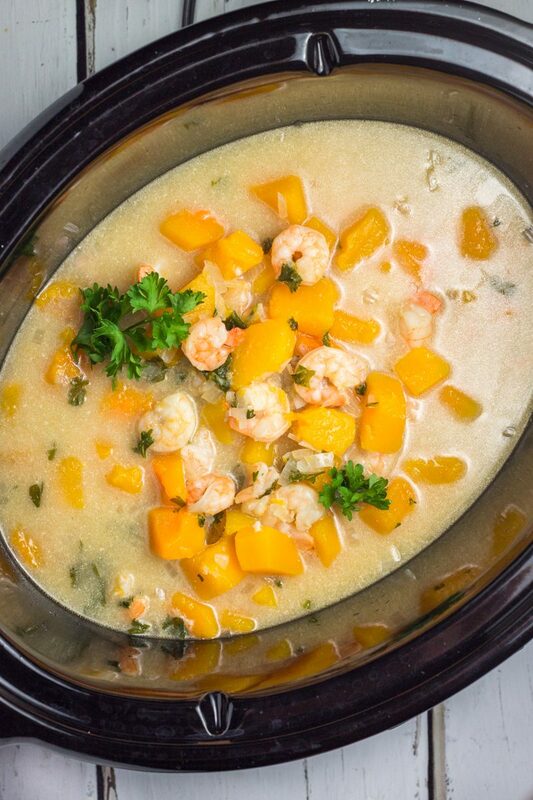 You can’t not love this simple slow cooker shrimp butternut squash chowder! Just a few ingredients makes this paleo and Whole30 set-and-forget dinner a winner. It’s perfect for busy work weeks and laid back weekends – packed with veggies and tender shrimp. My kids are starting to take interest in the kitchen. It’s both a blessing and a curse. I don’t love when they want to help me as I’m chopping veggies with a very large (and sharp) knife or when they are dying to sit next to the stove as I sauté something in hot oil. My sweet little people, you can help me mix and bake and combine. You cannot help me by wanting to place your hand into the flame of the gas stove, or licking the pairing knife, or exploring the bottom of the blender. I’m going to have to end this session of kitchen fun right there. I know, mom is soooooo lame. 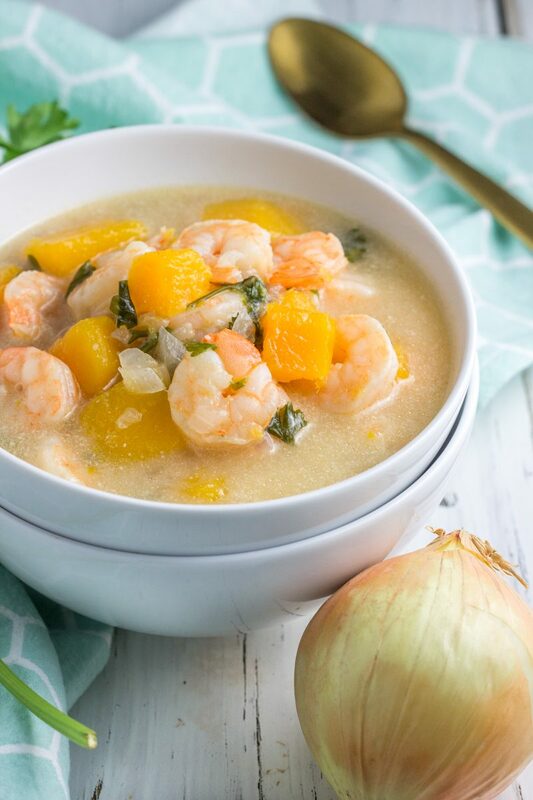 When we aren’t having family fun baking time, I let them help me assemble meals like this slow cooker shrimp butternut squash chowder. No hot oil, no open flame, lots of dumping and even button pushing!! His love pushing buttons – I know because anytime we’re done bonding in the kitchen, my coffee maker is on, blender dial is funky, and microwave clock is reset. Oh kids and their buttons. I love this simple slow cooker meal because it’s easy to throw everything together, set it, and forget it. Plus it’s dairy free, paleo, and even Whole30 compliant. 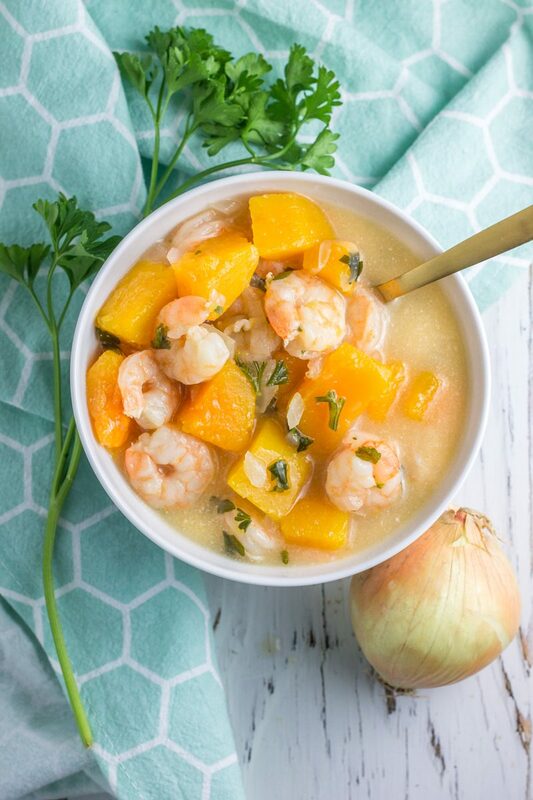 When chilly fall evenings arrive, this slow cooker shrimp butternut squash chowder is exactly the ticket for a healthy dinner that warms the soul. To be totally honest, I wasn’t super confident this was going to taste great. The ingredients minimal are SO simple, and it looks like my four-year-old came up with this recipe. But it comes together in such a tasty way, I was very surprised at the result! 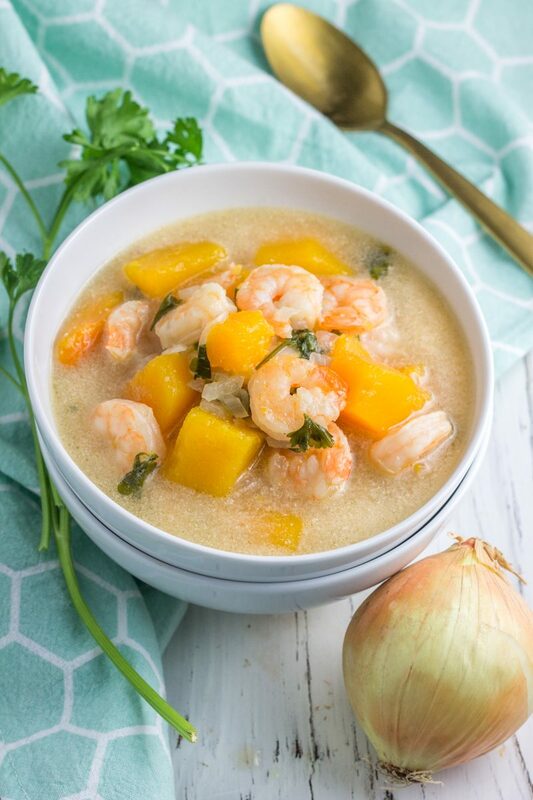 Anyhoo, this slow cooker shrimp butternut squash chowder is a must make this fall and winter – seriously so hearty and so easy it should shouldn’t be legal. It’s the perfect healthy meal to serve the family or a crowd, and even reheats well for for leftovers all week. Crockpot chowder is the name of game when the temps cool down. And when you’re ready for more ‘warm the soul’ type of healthy dinners, try these! A1 Inspired Slow Cooker Beef Roast, Hearty Midwest Vegetable Stew, Parsnip Leek Butternut Squash Soup, and this Tomato Basil Bisque with Italian Meatballs. 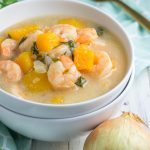 This easy slow cooker shrimp butternut squash chowder is a paleo, Whole30 compliant meal made without fuss. It’s the perfect hearty and healthy crockpot meal!